Well the past month has been a mixed bag with highs and lows. I completed my Module 7 and submitted it for assessment. I got a good report back but have a bit of "tweeking" to do on my wall hanging, so hopefully next week should see me in a brighter frame of mind to tackle this. 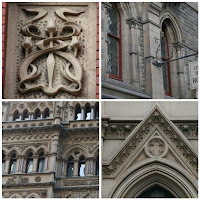 I went over to Melbourne to visit hubby, who's working over there, and had a lovely week. Weather was cold and brisk, bringing back memories of England, but nice and refreshing. 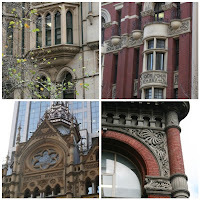 I LOVED the architecture of Melbourne and went a bit snap happy. It's such a lovely city with so much to see and photograph ... twice I was approached and asked if I was a professional photographer!! Spent a morning at the Victoria Markets .... what a place! 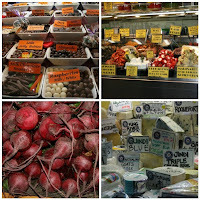 I could live in Melb just for the food and produce ... so much to choose from, good prices and all freshly picked. 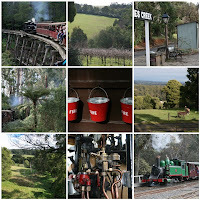 We spent a day travelling through the Dandenong Ranges on the Puffing Billy train. Great experience ... even though it was an open sided train and the weather was only 6C!! Scenery was stunning ... would recommend it to anyone. 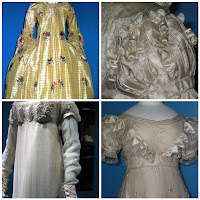 I spent days and days visiting art galleries and museums, and in the National Gallery of Victoria (International) I found an exhibition called "Persuasion : Fashion of the Age of Jane Austen". What a find!!!!! Beautiful costumes. So all in all a great week in Melbourne, but came home and had my feet kicked out from under me when I came down with swine flu. I was very ill for 10 days and just as I was starting to pick myself up we were then knocked down again by the passing of a very good and dear friend. Highs and lows .... such is life.